Hospital Regional do Huambo; Hospital Municipal do Bailundo, Hospital Municipal da Caala e Hospital Municipal do Cambiote. *Professora Associada, Faculdade de Medicina do Huambo da Universidade José Eduardo dos Santos. Especialista em Ginecologia e Obstetrícia, Mestre em Educação Médica. **Assistente de Investigação, Faculdade de Medicina do Huambo da Universidade José Eduardo dos Santos. Mestre em Psicologia Clínica, Departamento de Investigação Científica e Publicações. ***Professor Associado com Agregação, Faculdade de Medicina da Universidade de Lisboa. Assistente Sénior, Departamento de Obstetrícia, Ginecologia e Medicina de Reprodução, Centro Hospitalar Universitário Lisboa Norte-Hospital de Santa Maria. Aim: Maternal mortality is particularly frequent in Sub-Saharan Africa, and Angola is believed to have one of the highest rates in the world. The aim of this study was to identify the main causes of maternal deaths in the four reference hospitals of the Huambo Province, from 2011-2013. 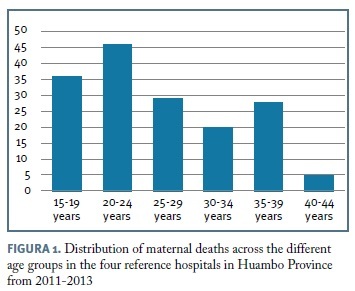 Methods: In this observational study, we analyzed maternal deaths recorded between 2011 and 2013, reviewing the clinical records and corresponding record books of the four main hospitals of the Huambo Province. Results: We identified a total of 164 maternal deaths. Almost 50% of women were between 15 and 24 years, 29.2% only had primary education, 48.1% resided in rural areas, and 39% were transferred from other health facilities. Data on previous pregnancies and deliveries, as well as on prenatal care were frequently missing. Most maternal deaths were from direct causes (77.4%), with hypertensive diseases accounting for 25%, sepsis for 23.1%, haemorrhage for 17.6%, and uterine rupture for 9.7%. Of the indirect causes, the most frequent were hepatitis, malaria, tuberculosis and HIV/AIDS. 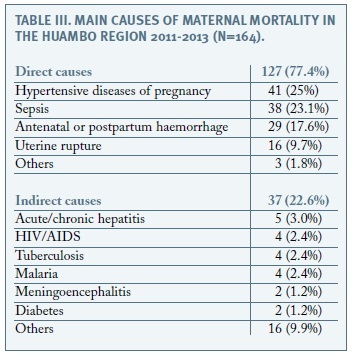 Conclusions: Hypertension, sepsis and hemorrhage are leading causes of maternal deaths in the Huambo region. Poor quality of hospital and prenatal care records is frequent. These findings can help to guide strategies to reduce maternal mortality in the region. Keywords: Maternal mortality; Sub-Saharan Africa; Hypertensive diseases of pregnancy; Obstetric hemorrhage; Sepsis. Maternal mortality is a robust and sensitive indicator of the differences in level of healthcare among social groups, regions and countries. It reflects access and quality of care during pregnancy, and is closely related to other less robust indicators such as perinatal mortality, maternal and neonatal morbidity, and permanent sequelae for the mother and child3. An estimated 576.300 maternal deaths occurred worldwide in 1990, while in 2010 this decreased to 287.0002. High-resource countries report maternal mortality rates (MMRs) of 5-10 per 100.000 births, while some low-resource countries in Sub-Saharan Africa and Asia report MMRs of 500-800. Angola has an estimated rate of 593, and although this represents a large improvement from the 1309 estimated in 1980, 1.156 in 1990, and 1.105 in 2000, it remains one of the highest in the world. With an area of 35.771 Km2 and over two million inhabitants, the Huambo region is located in the centre of Angola, and houses the second largest city in the country, distancing 600 km from the capital. Agriculture and mining represent the main economic activities of the population. To our knowledge, only one previous study has evaluated maternal mortality in Angola and refers to one single centre in the Kuando Kubango province4. The aim of the present study was to identify the main causes of maternal mortality occurring in the Huambo region of Angola between 2011 and 2013. This knowledge is important to help shape and strengthen local and national maternal health improvement programs. In this observational study, we visited the four reference hospitals of the Huambo region (Huambo General Hospital, Caála, Bailundo and Cambiote municipal hospitals), to review the handwritten record books where maternal deaths are registered. Cases complying with the WHO-ICD10 definition presented above and occurring between January 2011 and December 2013 were selected for study inclusion. For all identified cases of maternal death, we reviewed the patients clinical files to obtain information on age, level of education, marital status, home environment (urban or rural), provenance at arrival to the hospital (from home or transferred from another health facility), number of prenatal appointments, type of delivery, obstetric complications, and presumed cause of maternal death. Where relevant, statistical analysis was carried out using measures of central tendency, mean and standard deviation. The 20th version of IBM SPSS Statistics (IBM corporation, USA) was used for calculations. Table I displays the overall number of births, live births and maternal deaths in each of the hospitals in the Huambo region, during the three study years. A total of 57 403 live births and 164 maternal deaths were registered in the four hospitals, for an overall MMR of 350 per 100 000 births. All clinical files of maternal deaths were available for review, after several visits to the hospitals. Figure 1 displays the distribution of maternal deaths across the different age groups, showing the highest numbers between 15 and 25 years of age. Mean maternal age was 26 years, with a standard deviation of 7.6 (minimum 15, maximum 44). Concerning education, 28.9% of women completed only four years of primary school and 20.5% had no formal education. Concerning professional activity, 47.9% had no formal occupation. Regarding marital status, 27.1% lived in a non-marital relationship and 26.5% were single. Deaths occurred during pregnancy in 123 cases (75%), intrapartum in 5 cases (3%), and in the four weeks following delivery in 36 cases (22%). During the puerperium, 11 women died in the first 24 hours following delivery (31%), and 17 women died after this but before the first week (47%). Death occurred in the Obstetrics department in 95.2% of cases, and the remaining died in other hospital departments. In 38.5% of cases, women had been transferred from another health facility, and in 47.6% women lived in rural areas. A total of 48 deaths (29%) occurred during the first 24 hours of hospitalization. No data on previous obstetric history was available in 57.3% of cases. For the remaining women, this information is displayed in Table II. In a large percentage of cases there was no registry of previous pregnancies or deliveries. Prenatal appointments were registered in 16.4% of case records, but the number of appointments was not specified. Delivery was registered as spontaneous vaginal in 110 cases (67%), cesarean section in 42 (26%), and vacuum extraction in 12 (7.3%). The registered motives for cesarean section were hypertensive disease of pregnancy in 19 (45%), cephalopelvic disproportion in 8 (19%), placenta praevia in 5 (12%), previous cesarean in 4 (10%), placental abruption in 3 (7%), suspected fetal hypoxia in 1 (2%), transverse lie in 1 (2%), cord prolapse in 1 (2%). Maternal deaths due to hypertensive diseases of pregnancy occurred in the early preterm period (24-32 weeks) in 8 cases (20%), at term in 25 cases (60%), and in the postpartum period in 8 cases (20%). Sepsis was observed before term in 13 cases (34%), and at term in the remaining 25 (66%). Hemorrhage occurred during the second trimester in 2 cases (7%), during the third trimester in 4 cases (14%), and peripartum in 23 cases (79%). All 16 cases of uterine rupture occurred at term. The three other causes of direct maternal death were associated with ruptured ectopic pregnancy at 9 weeks, anaesthetic complications at term and septic abortion at 14 weeks. The 16 other cases of indirect maternal deaths were related with the following diagnoses: hepatic encephalopathy (n=3), pneumonitis (n=3), typhoid fever (n=3), thromboembolism (n=1), epilepsy (n=1), rabies (n=1), digestive tract hemorrhage (n=1), dental abscess (n=1), respiratory insufficiency (n=1), and renal insufficiency (n=1). A high MMR was observed in the Huambo region hospitals, albeit somewhat lower than that reported for the whole country, and from another reference centre in the country (1803 per 100 000) 4. In our series, direct causes accounted for the majority of maternal deaths, with hypertensive diseases of pregnancy, sepsis and hemorrhage as leading factors. Poor quality of hospital records and low use of prenatal care were also observed. The present study constitutes, to the best of our knowledge, the largest report on the causes of maternal death in Angola, and the only one to evaluate the problem at a regional level. All data were extracted by an experienced local obstetrician, evaluating patients notes. These constitute the best available source of information in our settings. Targeting of the four main maternity hospitals in the region assures a wide representation of birthing facilities, and they constitute the most likely places where maternal deaths occur. Official records in the province of Huambo indicate that a total of 84 399 deliveries occurred during the study period, of which 57.403 in these four hospitals (68%). While it is likely that most serious complications are refered to these hospitals, it is possible that women also died at home, during transport to the hospital, or in Health Centres. The study population may therefore not represent all maternal deaths in the Huambo Province. An estimated 60% of African women give birth without the presence of a qualified health professional and two thirds of women who need emergency obstetric care do not receive it 5. Among other limitations of this study are its retrospective nature and imprecisions in case notes. The cause of death was established according to the existing medical records, and these can be affected by the limited availability of diagnostic tests and staff experience. Maternal mortality is an important social problem, and any program designed to reduce its incidence needs to take into account socio-economic factors. A large number of maternal deaths occurred in women less than 25 years old, with limited education, no professional occupation, in non-marital relationships, and living in rural areas. Strategies are therefore needed to target these groups, expanding health coverage and conveying information that allows women to seek healthcare in a timelier fashion. Delay in seeking medical assistance and health illiteracy, together with incorrect, delayed or inexistent treatment appear to be the most important factors affecting maternal mortality in other regions of the developing world 5-7. Poor record keeping was another consistent finding, particularly regarding previous obstetric history and prenatal care. Healthcare professionals must be made aware of the consequences that can arise when no information is registered during pregnancy or when this is not available at the time of hospitalisation. The situation emphasizes the need to develop an efficient network of primary healthcare facilities which allow adequate obstetric follow-up and suitable registries. The main findings of the study are related to the clinical situations leading to maternal death. Delayed transfer to hospitals, inadequate diagnosis/treatment, excessive interventions, or a chain of events triggered by anaemia, hypertensive diseases of pregnancy, severe bleeding, obstructed labour or post-partum infections have all been implicated in maternal mortality in other African countries1. In our population, excessive obstetric intervention does not seem to be a major factor, as the caesarean section and instrumental vaginal delivery rates together did not exceed 33%. Hypertensive diseases of pregnancy and postpartum hemorrhage were important causes of maternal death, and similar findings are reported in other low-resource settings 8-10. Difficult accessibility to obstetric care, poor antenatal care, inadequate note keeping, and incorrect, delayed or inexistent treatment may all be involved. Maternal mortality is a robust indicator of a country or regions socio-economic development. It affects families and societies, and compromises the economic development of a country. The majority of causes are avoidable by providing appropriate information to women, accessible obstetric care, and trained healthcare professionals. The findings of this study may help to guide strategies aimed at reducing the burden of the problem in Angola and other Sub-Saharan countries. 1. Medina-Nava PM, Corona-Gutierrez AA, Arias-Merino A. Torres-Mercado AJ, Panduro-Baron G, Gonzalez-Moreno J. Causas de muerte materna de 2007 a 2010 en el Hospital Civil de Guadalajara Dr. Juan I. Menchaca. Revista Médica MD 2013;4;219-226. 9. Bailey PE, Keyes E, Moran AC, Singh K, Chavane L, Chilundo B. The triple threat of pregnancy, HIV infection and malaria: reported causes of maternal mortality in two nationwide health facility assessments in Mozambique, 2007 and 2012. BMC Pregnancy Childbirth. 2015 Nov 9;15:293.